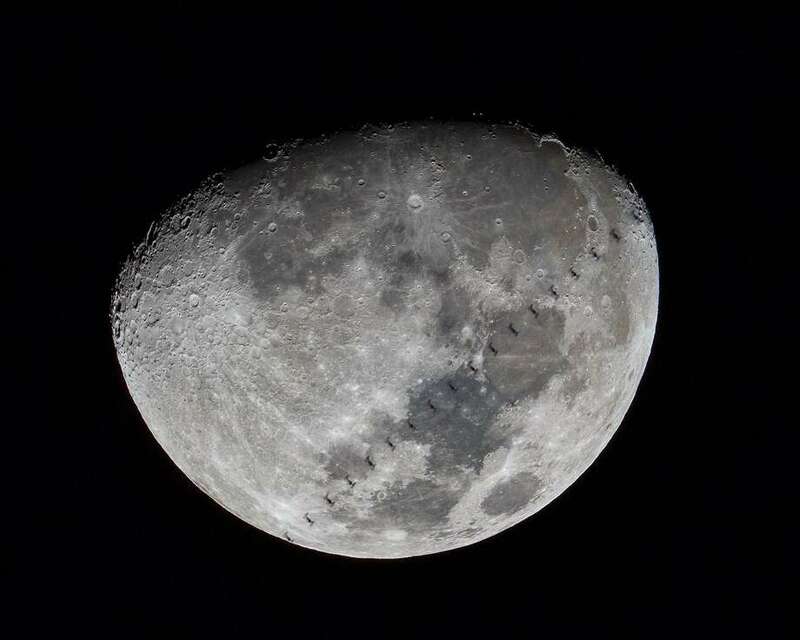 The International Space Station crosses the face of the moon, March 16, 2019. That’s the window, if you want to catch a picture of the International Space Station as it passes across the face of the moon. Less than two-thirds of one Mississippi. If that’s not a small enough window for you, consider this: It’s a .63 second-long event that happens maybe once or twice a year, considering the orbits of both objects. Remember, the ISS is orbiting at 17,000 miles-per-hour, 283 miles above the Earth. To use a metaphor, “This is the literal equivalent of trying to photograph a football field in Montreal from Fairfield County that’s moving at Mach 22.5 and only visible through a window for 0.63 seconds,” said Shannon Calvert, president of the Westport Astronomical Society. But that’s not all. The conditions have to be just so. By “narrow path of visibility,” Calvert is referring to the 2.75 miles-wide path from which the transit is visible. Outside that track and you see nothing. And of course the weather has to cooperate. “And we all caught it,” he said. To be fair, technology does make the task somewhat easier. If you want to know where to be to catch a transit of ISS, there’s an app for that — transit-finder.com “calculates passes for any given location a few weeks in advance,” Calvert said. When you start talking about the technology used to actually capture the event, it gets technical. “I was shooting at 1/2000 of a second and probably should have gone even faster,” he said. To make sure the tiny window wasn’t wasted, the team took video clips, and then created a composite of the frames. The resulting photo is a composite of every other frame from a 1080p video clip, which makes sure you get the photo but sacrifices resolution.